In this section of the blog, each week I’ll be sharing with you one of the many software applications (often “freebies”) that I find useful in my day-to-day role here at Zen Software. This week I want to introduce HDTune Pro. 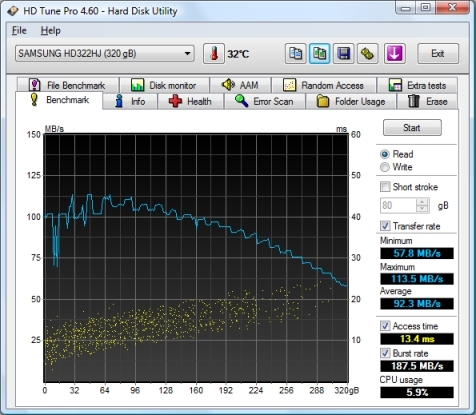 HDtune Pro is a simple piece of software that is designed to give you a clear benchmark report on the speed of a hard drive. This has proven very useful in diagnosing a range of problems we have seen when access speed to files is compromised. By running HDTune Pro you can clearly see the maximum file access speed across the whole surface of the drive, and whether this matches the drives specification. On a suspect drive you often see that the data rate varies significantly and you get large areas of the disk that are much slower than others. This could point out early signs of a drive that is about to fail. It’s always best to run tests on hard drives when they are not in use to get the most accurate reading so I often run these tests out of hours, but as they typically only take a few minutes to run it’s not usually a big problem. If you’ve never tried HDTune Pro I would recommend you download the free trial today from www.hdtune.com and start scanning your own hard drives – you may be surprised to find they are not running quite as quickly as they should be. ← Did you know BackupAssist image backups can be recovered direct to a virtual machine?